They have led their companies with elan and vigour, ensuring high growth despite the diffi cult economic environment. 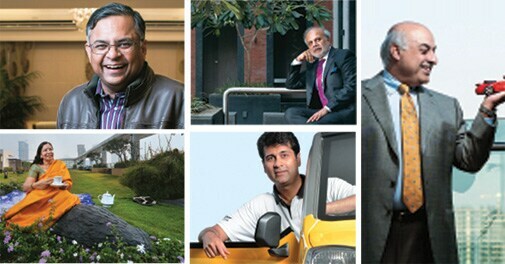 Business Today, with knowledge support from PwC India, presents India's Best CEOs in 2013. Corner offices of companies across the country have been feeling the heat for some time now. Falling demand both in India and abroad, runaway input costs, stubbornly high interest rates, policy paralysis in government, deliberate targeting of particular companies by the government, have all vitiated the business environment in the country. The life of an Indian CEO today is unenviable. Instead of bemoaning current conditions, however, Business Today has chosen to celebrate those CEOs who have defied the hostile conditions to deliver stunning results. We have prepared our first and definitive listing of India's top 100 CEOs. We have also identified India's Best CEO and the Best CEOS across nine other categories. A CEO's performance cannot be measured merely by the numbers his/her company delivers across various metrics. So we, along with our knowledge partner PwC, designed an elaborate two-stage process - both quantitative and qualitative - to choose the best of the lot. The quantitative process sifted through the BT500 database on India's most valuable companies (see www.businesstoday.in/bt500 )A five-stage filtration process eliminated companies that did not qualify. We followed this up with a three-phase evaluation of the qualifying companies on parameters such as top line, bottom line, market capitalisation and return on equity. This led to our list of India's top 100 CEOs. It also enabled us to finalise the nominees for each of our categories . To choose the winner in each category from among the nominees, we turned to the qualitative aspect. We set up an independent jury chaired by K.V. Kamath, Chairman, ICICI Bank. The other jury members were J.J. Irani, Ex-Managing Director, Tata Steel; Subodh Bhargava, Chairman, Tata Communications; Samir Barua, ex-Director, IIM Ahmedabad; and Amit Tandon, Founder and Managing Director, Institutional Investor Advisory Services India (IiAS). Decisions were reached at an intense 90-minute jury meeting on November 11 in Mumbai, moderated by Business Today's Managing Editor Josey Puliyenthuruthel with technical support from Shashank Tripathi, Leader, Strategy, PwC India, and Arup Mazumdar, Principal Consultant, Strategy and Research, PwC India. A word on the winners. Ever since N. Chandrasekaran took charge as CEO of IT services major TCS, the company has seen a scorching pace of growth. This year, for the second year running, the company topped the BT500. It came as no surprise then when the jury picked Chandrasekaran as India's Best CEO in 2013. He also bags the Best CEO award for the IT & ITeS category. What makes Chandrasekaran tick? Find the answer in our profile. There are also detailed profiles of winners in the other categories: Shikha Sharma (Best Woman CEO), Rajiv Bajaj (Best CEO: Automobiles), Nitin Paranjpe (Best CEO of an MNC as well as Best CEO: FMCG), Aditya Puri (Best CEO: BFSI), K.K. Sharma (Best CEO: Pharma and Health Care), Akhilesh Joshi (Best CEO: Core sector), and V.C. Sehgal (Best CEO : Auto Ancillaries). In a separate report, this year's winners tell us how they overcame their own weaknesses to become the effective CEOs they are now. What are the managerial traits an Indian CEO needs to have to deliver results? A column by jury chairman Kamath looks at how corporate leaders are made, while another by PWC's Tripathi discusses the conundrum the Indian CEO faces - defend his home market while foraying globally. In an interview, management guru Ram Charan talks of the changing role of the CEO and more. We also have an analysis reprinted from Harvard Business Review on how creating a sustainable competitive advantage is fast becoming a challenge.